The gym has 140 stations and is fully equipped to offer a variety training options for our members. There are two pools in the centre. The fitness pool is 30 metres long, with 5 lanes and the teaching pool is 8 metres by 5 metres with designated changing villages for males and females, serving both pools. The studio is a beautiful space dedicated to our range of fitness classes. Relax, revive and refresh in our luxurious yet uniquely affordable spa. As well as providing you with a relaxing Thermal Spa Experience, we offer spa treatments to leave you feeling pampered and looking great. Our onsite creche is a fun and safe enviroment for you children to play under the supervision of our qualified staff, so you take part in leisure activities or attend the gym. Our meeting room is available to reserve for private hire. Want guaranteed results? 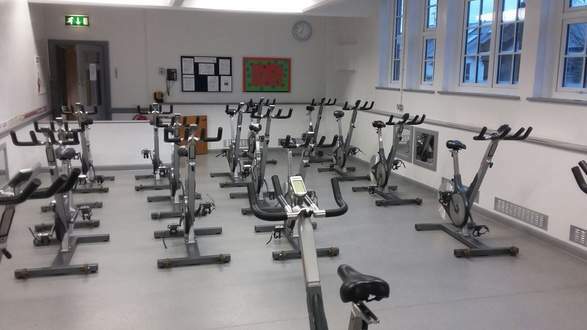 Look no further than our Group Cycle classes within our dedicated Group Cycle Studio.